A fun and stylish combination sure to impress your guests! A rustic woodgrain background sets the stage for a modern geometric frame and trendy accents of elegant greenery. These Botanical Frame reception cards feature your choice of three real foil color. 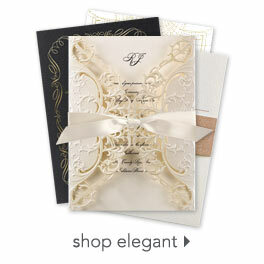 Personalization Options: Woodgrain background and leaf design are printed as shown. Real foil frame is printed in your choice of gold, rose gold or silver. Your wording is printed in white in your choice of fonts.